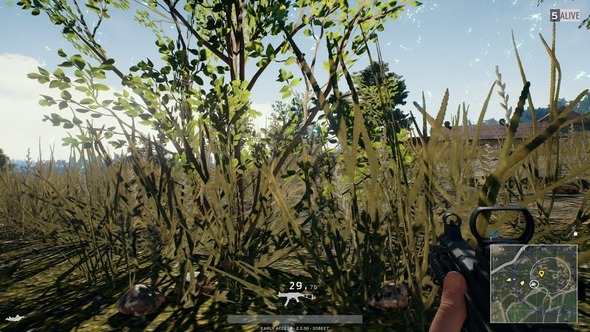 Ask the 99 adversaries you begin each round packed into a plane with what they like about PlayerUnknown’s Battlegrounds, and no one would say ‘crouching in a bush’ or ‘remaining motionless outside a gas station’. No one would say anything at all, in fact, because they learned long ago that Mute All is as essential to playing the game as turning on their PC. 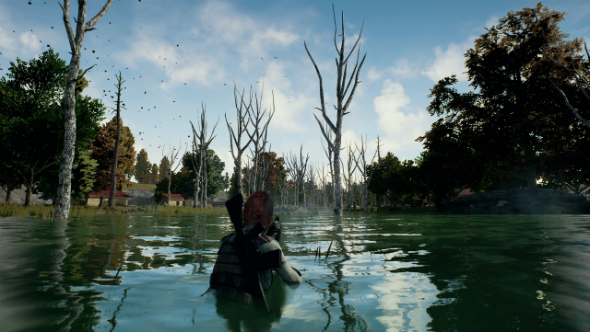 But while it can be chaotic, and does have an uncanny capacity for creating moments of improvised spectacle, it’s the extended lulls in the action which prove the greatest testament to Battlegrounds’ conceptual strength. If you love PlayerUnknown’s Battlegrounds then you’ll be interested in the best survival games on PC. It’s possible – advisable, even – to go upwards of ten minutes without firing a weapon or spotting another player on the 8x8km game map. In the absence of gunning people down, resource management and navigation become the focus. In other words, looking for guns in houses and looking at your map. The achingly slow pace of this phase should by all rights prove tedious, as large map navigation inevitably becomes in single-player open-world titles and survival games with more free-form design. The difference in Battlegrounds is that something genuinely could happen at any second. After all, there are a hundred of you here on this island. Who’s to say there isn’t someone in that hut on the horizon, eyeing you through a 4x scope? How do you know that noise you thought you heard wasn’t a motorbike about to emerge from the woodlands, lining you up ready to transform you into a humiliated pancake? And are you sure that’s just a shrub you’re looking at? On the surface, it appears it’s the players themselves who imbue Battlegrounds with this exceptional quality to turn the mundane into something incredibly tense. 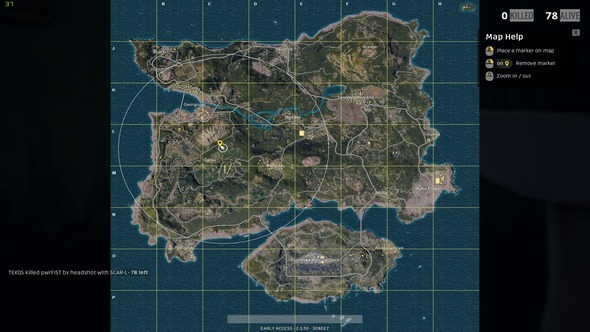 That’s partially true – a solo expedition of the map would have very little to offer – but if it were purely down to the simple fact you’re sharing a space with so many other unpredictable players, would 170,000 people each day still choose to play Battlegrounds over every other online survival game? Instead of maintaining total player freedom, and in the process, leaving every meaningful encounter down to sheer chance, designer Brendan Greene and developers Bluehole refined and constrained the experience offered by DayZ, Rust, and Ark’s own prototypical battle royale mode, Survival of the Fittest. It’s a finite experience in which you’re constantly being squeezed closer to one another and forced out of strongholds as the play area decreases. Meeting another player in DayZ was a highlight reel moment of 2013, and the impossible choice between bargaining, double-crossing, or entering combat from the off is what popularised a genre. But even after 20 minutes exploring Chernarus there was no guarantee you’d see another soul, because there was no imperative on anyone to move anywhere or do anything. Without an endgame objective or a time limit, moments of doing nothing in DayZ lacked any real sense of tension. You know you’re going to have human contact in Battlegrounds. 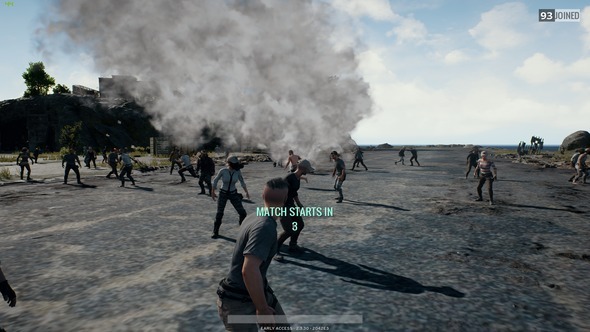 In fact, after a bewildering minute in the pre-game warmup area watching 99 people set fire to each other, take off all their clothes, and slowly rotate in the prone position, the solitude that comes after parachuting out of the plane once the match begins is blissful. Knowing with certainty that the encounters are coming by mandate of the game rules ensures the tension is ever-present. At other times that solitude is more hard fought. Certain areas of the map are more popular starting destinations than others (check out our Battlegrounds guide for the hot zones) and sometimes you might have to stand and fight immediately upon hitting the ground. After surviving a drop like this, taking a minute while hunkered within a nice, safe cottage in the countryside later in the game is a joy that cannot be rivalled. 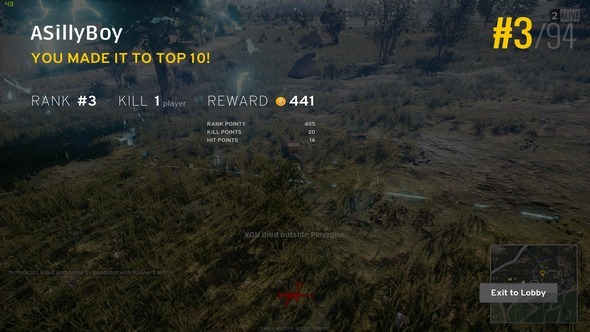 And for those without the requisite FPS or military sim experience necessary to rack up the kills in Battlegrounds, it’s a revelation to realise that doing nothing is actively helping you win the game. You may simply be inching through a corn field on your belly in proximity to no one at all, but someone, somewhere, just got killed. You saw the message pop up and everything. And as that person met their fate, you got one notch closer to victory. It’s not just a whimsical thought – it’s a direct subversion of multiplayer shooters since their inception. Doing nothing is… good. You’ll have to kill someone eventually to prevail overall, of course, and you won’t win much of an audience share on Twitch by hiding away well into the final stages. Regardless, it’s liberating. Other design decisions that contribute towards the goal of maintaining constant tension during inactivity are less obvious. The fantastic sound design, for example, is both a wonderful atmospheric tool and a crucial game mechanic. The poet in you wants to stop and ponder the sound of falling bombs in a nearby red zone, while the soldier in you has already hit the deck after hearing the screech of a Dacia’s tyres somewhere in among the shells. Individual sound sources can be localised with life-saving accuracy if you have a decent headset equipped, so even something as passive as sitting and listening contributes towards your overall survival. Speaking of screaming Dacia tires, the number, placement, and movement speed of the vehicles themselves are already very well-balanced. You’re extremely likely to see at least one or two chancers in Jeeps or motorcycles hurtle past you at some point, but whether you choose to engage is another matter entirely. Those inside vehicles are certainly vulnerable, but often the smartest move is to – yep – do nothing. Let them pass. Very few games can claim to offer such excitement and fulfilment in moments of genuine inactivity as Battlegrounds. Superlative stealth-action game Dishonored 2, for example, managed to make hiding in a cupboard feel enjoyable for at least a few seconds, but its pacing was never intended to have that feeling endure for minutes on end. 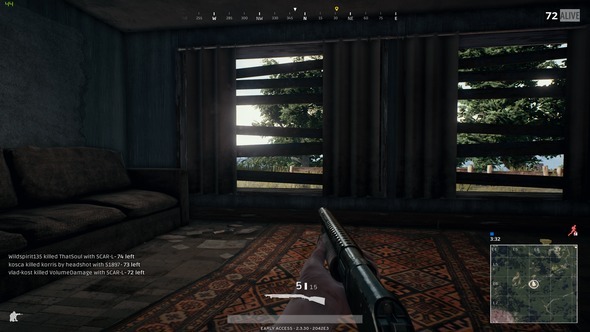 With much more content planned from Bluehole between the present time and Battlegrounds’ graduation from Early Access to full release, it’s reasonable to expect a greater breadth of tactical approaches to emerge and a more sophisticated approach from high-level players in finding those who’d rather hide until the player count drops below 20. But the sensation of immersion and electricity it summons as you sit before the window of a run-down farmhouse listening to the drizzle hitting the roof, puts it in fine stead for long-term appeal.